If you, like me, have any interest in ministry to Mormons, you will appreciate Ross Anderson's series currently in process at Koinonia. Anderson was raised LDS and has written a book called Understanding the Book of Mormon. If you have not done much Mormon ministry, you may find this especially helpful. 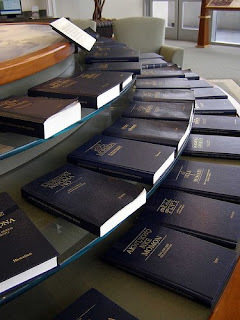 Even if you have never interacted with a Mormon, you may have come across apologetic issues regarding the falsehood of LDS teaching, especially regarding the history of the BoM. Perhaps you have learned some of those proofs and sat down with a Mormon for the first time, only to find that they fall on deaf ears. It is strange that Mormons will deny your arguments without really ever arguing back. That is because at the heart of LDS experience is a religious epistemology in which truth is validated by an inner witness rather than by arguments. I have only met a few Christians for whom apologetics has been instrumental in their conversion, but I have met no Mormons for whom that is the case. That inner witness experience is foundational for nearly all members of the LDS church, and it centers on the experience they have reading the Book of Mormon. That is why Ross Anderson's posts are helpful if you have little experience with Mormons: they succinctly explain the ins and outs of this type of LDS experience in its related to the BoM. Check them out here, here, here, and here, in that order. The last two are probably the most helpful for those of you who have limited Mormon ministry experience or who have been confused by what has happened in that experience. And his series, by the way, is not yet finished.